JetBrains has announced IntelliJ IDEA 12 having a better compiler, support for Java 8, an Android UI Designer, a new look, better Spring and Play 2.0 support, and a large number of enhancements across supported languages and frameworks. Java 8. IntelliJ IDEA 12 is prepared for Java 8 with code assistance for lambda expressions, method references and default methods. Android UI Designer. If IntelliJ 11 added a UI preview pane, this version comes with a feature rich designer (shown below) enabling developers to perform some operations with the mouse, such as adding/moving/deleting/copying components to Canvas or Component Tree. The designer also supports all layout types. Frame, Linear, Grid, etc., and multiple device profiles. Spring. JetBrains’ IDE now has code assistance for more frameworks - Integration,Web Flow, MVC, Security, Batch, better performance, drag-and-drop dependency diagrams, and others. Play 2.0. Play applications can be created in Java & Scala with support for code assistance, templates, formatter, refactoring, etc. New Look. 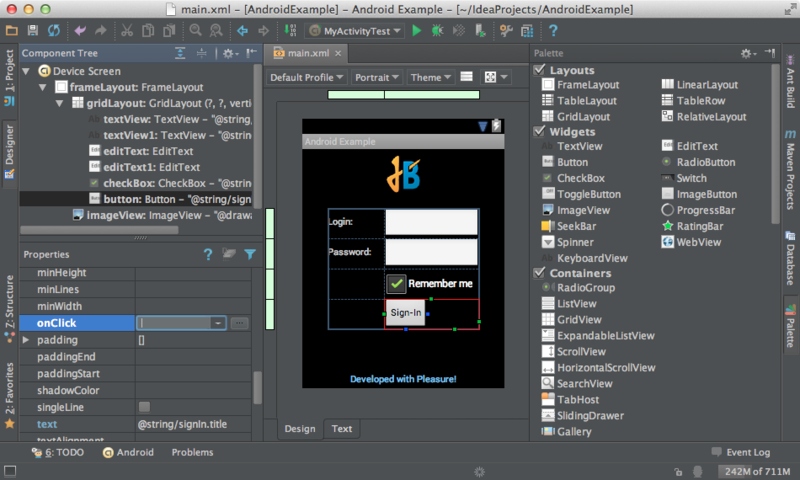 The IDE has a new fully customizable look and feel called Darcula (shown above). Defining and creating databases from inside the IDE. Better management tools for J2EE application servers with support for Cloud Foundry and Cloud Bees. There are lots of enhancements to various features across the IDE. Jelastic, a hosting provider for Java applications, has recently upgraded their IntelliJ IDEA plug-in enabling developers to create Java, JRuby, Scala, Groovy and ColdFusion/CFML applications and to deploy them to their PaaS. They advertise vertical scalability on demand with scaling back when resources are not needed, zero lock-in – meaning the apps have no specific code-, and paying for what you use. Jelastic is integrated with build systems such as Maven, Ant, Hudson and Jenkins. It also has an Eclipse plug-in.